For an ultimate diving and snorkeling experience, visit Great Barrier Reef and explore the great barrier reef islands. 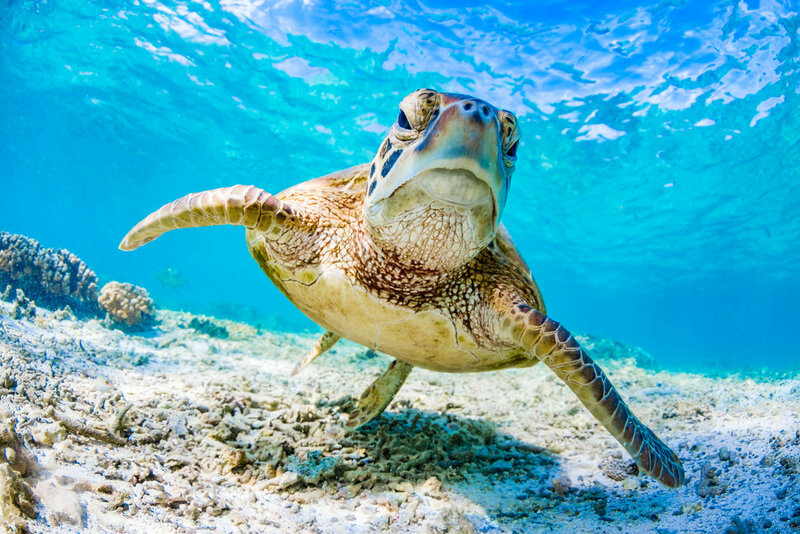 The endangered reef is one of the world’s most beautiful natural wonders and a must-see. On your Barrier Reef tours, you will witness the amazing and vibrant coral species that have existed for thousands of years. Are you tempted already? Before you start packing your bags, take a look at the following guide on Great Barrier Reef location and more. How long is Great Barrier Reef? Its length is equivalent to 70 million football fields or approximately half the size of Texas, USA. The Great Barrier Reef is located next to Queensland and considered the largest coral reef in the world. It was discovered in 1770 by the British explorer James Cook. In 1981, the reef was declared a World Heritage Site by UNESCO. The Great Barrier Reef now reaches a length of over 2300 kilometres, with its area covering approximately 35,000 square kilometres and consisting of about 2900 individual reefs, countless sandbanks and about 1000 islands. Coral reefs are the vulnerable and complex part of the Great Barrier Reef ecosystem that can only develop under very specific conditions. In the Great Barrier Reef the conditions have always been ideal so the imposing reef has been able to develop such rich species. The coral reef Australia boasts of has been created by the secretions of stone coral polyps and continues to grow over a very long period of time. The emergence of the northern Great Barrier Reef looks back on an approximately 20-million-year-old history. The middle and southern parts of the reef have already been existing for about two million years. The visible elements of the huge area were built around 10,000 years ago. A coral reef is a living organism whose extent and shape are constantly changing. As the world's largest creature-created structure, the Great Coral Reef provides habitat for numerous soft coral species, 1500 species of fish, about 5000 mollusc species, 800 echinoderms, and about 500 species, in addition to more than 350 hard coral and kelp species. There are also six sea turtle species, various whale species, manatees, and sharks that are native to this area. The species-rich ecosystem is due to numerous environmental factors, such as u.a. the acidification of the ocean and global warming, which is threatening its existence. Any change in water temperature can cause unpredictable damage to the reef. The Outer Barrier Reef is a must for those who want to do basic dives. This area includes the reefs of Flynn, Milln, Hastings, Thetford and Norman Saxon. The Inner Barrier Reef of Cairns consists of shallow reefs that are accessible for diving from the islands. From Cairns, for example, the Great Barrier Reef can be explored in its infinite variety as the reefs here are not crowded. If you stay in Queensland’s town of Cairns, you will easily be able to visit the reefs from there. Cairns has its own airports, railways, and seaport. Distance from cairns to Great Barrier Reef is 245 km and from Port Douglas Great Barrier Reef is 310 km. One of the best ways is to go on a Great Barrier Reef cruise as there is a variety of sailing ships on offer. An excellent choice would be to go on a high speed catamaran and sail through the outer reef. You will see the Great Barrier Reef marine park on the way as well as the World Heritage Site, Daintree Forest. Your Great Barrier Reef trips aren’t complete until you pay a visit to Cape Tribulation, Port Douglas, and take a tour of Bloomfield Falls. Where is the Great Barrier Reef located on the map? It is located off Queensland’s coast on the east side of Australia. The reefs start from the edge of Cape York Peninsula and extend down to Bundaberg. Where to stay in Great Barrier Reff? You will find Cairns, Port Douglas, and even Mission Beach good choices for finding budget-friendly accommodation. Why is the Great Barrier Reef dying? According to expert divers, up to 50% coral mortality has been found in Australia’s northeastern reefs. This is due to the occurrence of Great Barrier Reef bleaching, which is due to the warm sea water that causes stress to the corals. When this bleaching occurs, the corals expel the algae that they feed and get their colour from. If the heat of the ocean continues, the corals will die. Scientists are convinced that the biggest threats to the Great Barrier Reef are fossil fuel emissions from the carbon dioxide in the atmosphere. As the water warms, it becomes more acidic and will eventually kill off all the organisms. Perhaps the best way to preserve the coral reefs is to reverse global warming. But you don’t need to be a scientist to help make a positive impact on the reefs. By taking a few simple steps like walking or riding a bike to work instead of driving the car, disposing your trash properly and not polluting the water as well as using energy efficient heating systems, you can help reduce carbon emissions that negatively affect marine life. When is the best time for snorkeling in the Great Barrier Reef? In Cairns, you can enjoy the best scuba diving Great Barrier Reef has to offer so you will spend less time travelling and a lot more time snorkeling. The best times to go on Great Barrier Reef diving tours are when the water is clear and the temperature is less humid. Most boat tour operators begin their season in the month of June as there is less rain and the water is calm. However, you can experience the best snorkeling during the 'wet' seasons (summer and autumn) as the waters are warm. Can you visit Great Barrier Reef coral from Sydney? Not really, it would be easier to fly into Cairns instead as distance from Sydney to the reefs is 1,766 km. If you don't mind long journeys, you can take the train from Sydney. It will be a 14-hour trip to Brisbane before changing the train to Cairns, which will take a full day and a half before you reach the reefs. Where is the nearest airport to barrier reef Australia? The main airport for the barrier reef is Hamilton Island Airport. It is a fully-equipped and modern airport that handles daily flights direct from Cairns, Sydney, and Brisbane. How to reach the reef Australia? Since you can’t fly directly to the reef itself, you will need to fly to Cairns International Airport first. Yes! It can be seen from outer space as it’s the world’s largest structure formed by living species.